Now, this looks like an interesting app. 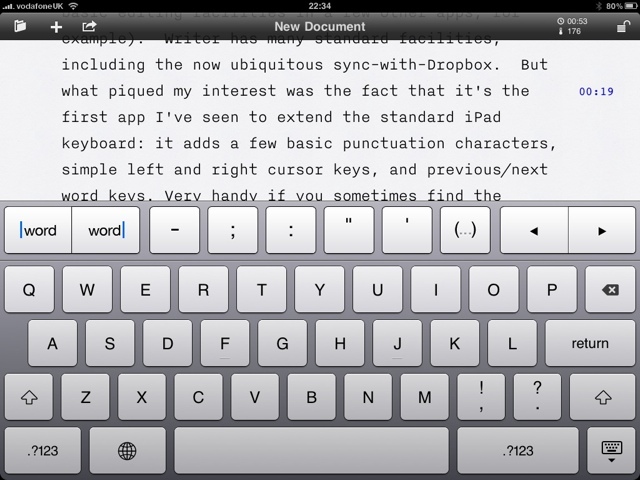 Called iA Writer, it is almost like a typewriter for the iPad. Formatting is definitely not included. I have several of these basic editors (Elements and Droptext, for example). Writer shares many of the standard features, including the now ubiquitous sync-with-Dropbox. But what piqued my interest was the fact that it’s the first app I’ve seen to extend the standard iPad keyboard: it adds a few basic punctuation characters, simple left and right cursor keys, and previous/next word keys. Very handy if you sometimes find the process of selecting a precise point with your big fat fingers a little tricky, as I do, though even that is easier here thanks to the large and well-spaced font the developers have chosen. So far, I’ve only written – let’s see – 170 words with it (it tells me that too), but I can see I could get to like it for any situation where I’m trying to do real writing on the ‘Pad.